Figure 1. 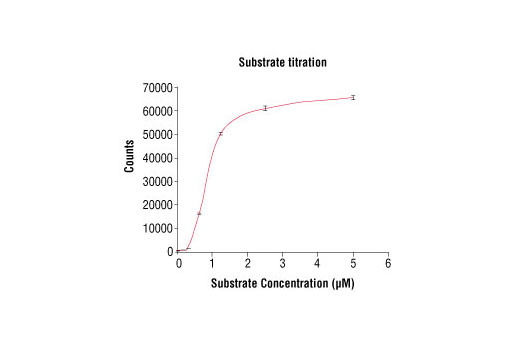 EphB3 kinase activity was measured in a radiometric assay using the following reaction conditions: 60 mM HEPES-NaOH, pH 7.5, 3 mM MgCl2, 3 mM MnCl2, 3 µM Na-orthovanadate, 1.2 mM DTT, ATP (variable), 2.5 µg/50 µl PEG20.000, Substrate: PolyEY, 0.5 µg/50 µl, recombinant EphB3: 25 ng/50 µl. 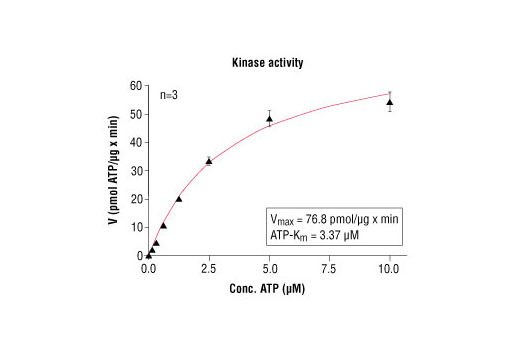 The kit provides a means of performing kinase activity assays with recombinant human EphB3 kinase. 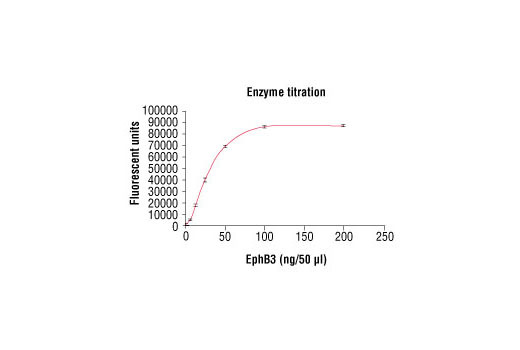 It includes active EphB3 kinase (supplied as a GST fusion protein), a biotinylated peptide substrate and a phospho-tyrosine antibody for detection of the phosphorylated form of the substrate peptide. Peptide substrate, Biotin-peptide 2,052 Daltons. GST-EphB3 Kinase: 80 kDa. The Eph receptors are the largest known family of receptor tyrosine kinases (RTKs). They can be divided into two groups based on sequence similarity and on their preference for a subset of ligands: EphA receptors bind to a glycosylphosphatidylinositol-anchored ephrin A ligand; EphB receptors bind to ephrin B proteins that have a transmembrane and cytoplasmic domain (1,2). Research studies have shown that Eph receptors and ligands may be involved in many diseases including cancer (3). Both ephrin A and B ligands have dual functions. As RTK ligands, ephrins stimulate the kinase activity of Eph receptors and activate signaling pathways in receptor-expressing cells. The ephrin extracellular domain is sufficient for this function as long as it is clustered (4). The second function of ephrins has been described as "reverse signaling", whereby the cytoplasmic domain becomes tyrosine phosphorylated, allowing interactions with other proteins that may activate signaling pathways in the ligand-expressing cells (5). Various stimuli can induce tyrosine phosphorylation of ephrin B, including binding to EphB receptors, activation of Src kinase, and stimulation by PDGF and FGF (6). Tyr324 and Tyr327 have been identified as major phosphorylation sites of ephrin B1 in vivo (7). Wilkinson, D.G. (2000) Int Rev Cytol 196, 177-244. 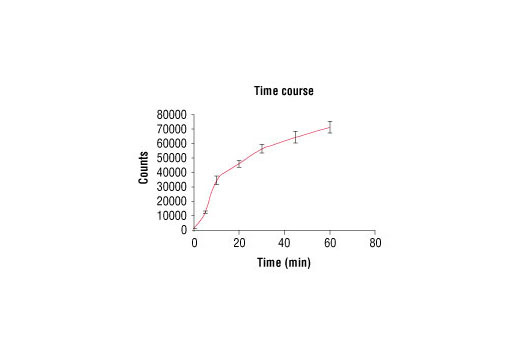 Klein, R. (2001) Curr Opin Cell Biol 13, 196-203. Dodelet, V.C. and Pasquale, E.B. (2000) Oncogene 19, 5614-9. Holder, N. and Klein, R. (1999) Development 126, 2033-44. Brückner, K. et al. (1997) Science 275, 1640-3. Palmer, A. et al. (2002) Mol Cell 9, 725-37. Kalo, M.S. et al. (2001) J Biol Chem 276, 38940-8. DELFIA is a registered trademark of PerkinElmer, Inc.